PowerAlert can monitor multiple UPSes (local devices as well as remote devices attached to other PowerAlert nodes). PowerAlert 12 also supports multiple vendor devices, although it should be noted that not all devices provide all of the monitored information. Last edited by ehall on Thu Nov 11, 2010 9:29 pm, edited 8 times in total. Any idea why thold wont work with this? I'm setting a templete to monitor the battery charge and it will not even apply to the device. Last edited by malichidemonos on Mon Jul 16, 2007 12:21 pm, edited 1 time in total. Thanks for the files and all of your work. I was able to get the temperature graph template working but I can't get the signal and capacity templates to show up under each UPS host. They are visible via the Graph Templates page but not where I would select the graph template to be used under a specific host. Any ideas, need more information? I am not able to get this to work for me looks like the script is not running ? I was having trouble putting images on this as it would just break. I was able to see everything install ok just not get graphing from it. Help would be great if you have any ideas. It looks like most every script and many plugins are going to need updating when they move to a newer version of cacti. As the Cacti group splitup the database information from the rest of the informatiion. Most files have to now be pointed to global.php insted of config.php. The problem I am having is my php seems to hang when running this script? Anybody have any ideas on this or what I can do to resolve my problem? Post subject: Error I am getting. I am getting this error and do not know what Is wrong or to look at. 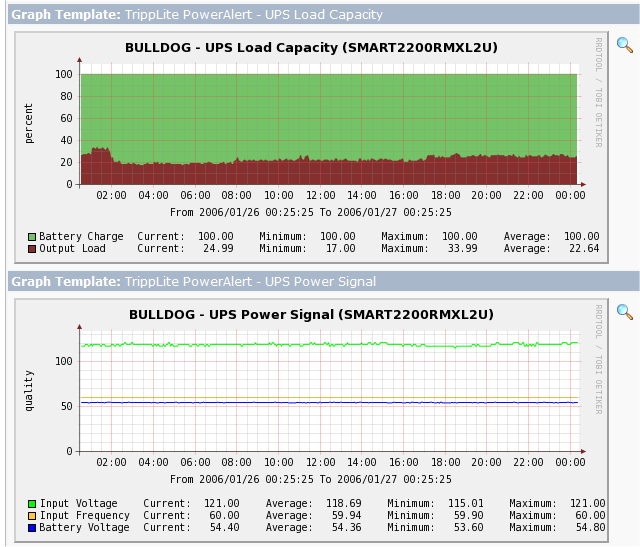 File comment: Both the Poweralert_ups_status.php and snmp.php. Incase I am missing somthing. Will this work directly with the UPS? IE. with the websnmp card? As for the question about working directly with the UPS SNMP-Web card, yes it will but you have to change the port number in the data template to 161. Alternatively, create a new data template that is specifically for use with the SNMP cards, but keep the data source names the same, and you will be able to use the graphs between both the software and the cards. When I run the php script it seems not to like the upsName variable. I am running the most current version of the Tripplite Agent downloaded today from their website. When I snmpwalk the device, I do get values and device name, but all I can see are the OID numbers and not the variable name. I was wondering if you might offer a suggestion about this. Discovered in the guide it says it's for php 5.2. I know the move to 5.3 broke some compat stuff across the board. Are there any plans for a future release?